Ramayana was composed 2 million years ago ! 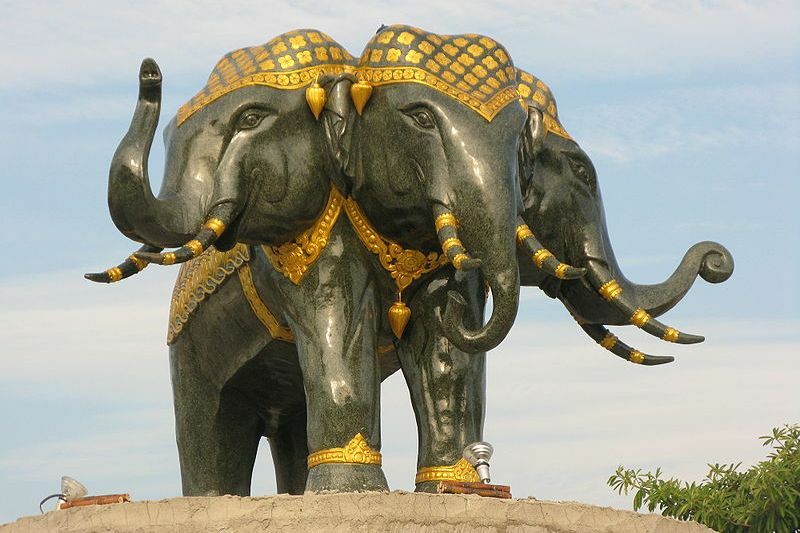 These elephants are very tall, imposing and have been trained to protect Lanka from invaders. Similar description is given by Trijata, the ogress guarding Sita in Chapter 27 of the same Kanda when she dreams of Lord Rama coming to Sita’s rescue riding an elephant high as a hill and bearing four tusks. Translation : The great Hanuma entered secretly Ravana’s inner city which was equal to paradise, rendered noisy by neighing of horses and tinkling of ornaments, by chariots, vehicles and aerial-cars and decorated by auspicious elephants and horses and great elephants with four tusks and by birds and animals in heat. It had beautiful entrances and was protected by thousands of rakshasas with great strength. Translation : Hanuman the glorious one neared and observed the best residence of Rakshasas and the house of Ravana, containing elephants with four tusks and also those with three tusks, those with two tusks and still not crowded. It was protected by soldiers bearing raised weapons. 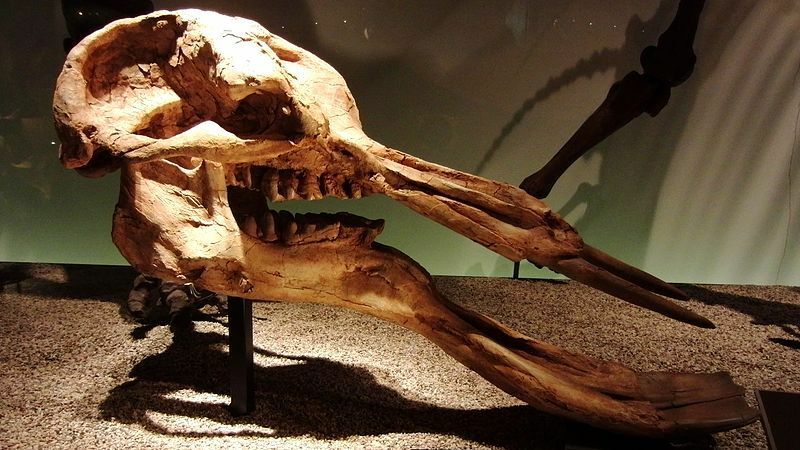 These Gomphotheres were believed to have existed on earth in different continents around 12-1.6 million years ago.Gomphotheres differed from elephants in their tooth structure, particularly the chewing surfaces on the molar teeth. Most had four tusks, and their retracted facial and nasal bones prompt paleontologists to believe that gomphotheres had elephant-like trunks. The early gomphotheres, such as Phiomia, had elongated upper and lower jaws, with relatively short tusks. Two lineages appear to have arisen from these ancestors. One, including animals such as Anancus, developed the short lower jaw typical of modern elephants, while the others, including Platybelodon, developed the lower jaw into an elongated ‘shovel‘, and shortened the upper jaw. There is no other book or script in history of mankind which describes about four tusked elephants. As they became extinct before many other stories were composed, no author could have seen it except Valmiki. Also many western researchers argue that Horses first appeared in North America about 60 million years ago as small dog like creatures and were not introduced in India until 1000 BCE. But, both Ramayana and Mahabharata (which happened around 5100 years ago) have mentioned chariots dragged by Horses, Aswamedha Yaga (horse sacrifice ritual) performed by Kings in ancient India. Also, according to Vedas and Puranas, Dwapara Yuga lasted for 864,000 years, Treta Yuga lasted for 1,296,000 years before Kali Yuga started. Its been 5100+ years since Kaliyuga started. 2,115,000 years which is approximately 2 million years ! 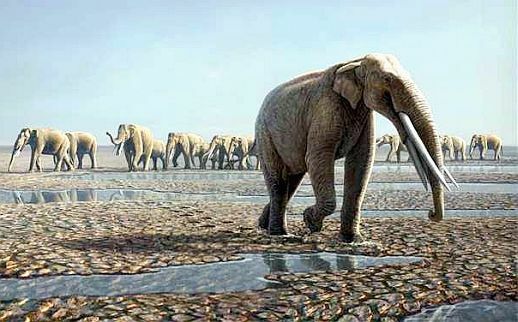 and this is when skeleptons of Gomphotheres were calculated to belong ! Even the Ram-Setu or Adam’s Bridge is supposed to be built around same time. Also in Puranas, Indra, the King of Devas (Gods) is said to be travelling on a white elephant called Airavata, which has multiple heads with 4 tusks for each. This is depticted as Erawan in Thailand.